Bad times can turn into good times. Henry is living proof. Henry was 25 in October 2014 when he learned he was HIV positive. The news hit him hard when he went to the clinic to get his test results. But he kept his eyes on the road ahead. Life tried to knock him down over the next 12 months, and he kept bouncing back up. Five months after Henry’s HIV diagnosis, his father died of cancer. They were very close, so it was a major blow. After that, he had to help his family find a new home because the one they were living in went into foreclosure. He blew out the engine in his car and took on a new job that didn’t work out as he’d hoped. Before long, he could barely pay his bills. “It felt like the whole year was just horrible,” he recalls. But things got better. Lots better. A few months after he was diagnosed, Henry went to his first support group for people living with HIV. At first, he was afraid people in the group would be staring it him, but it wasn’t like that at all. The group welcomed him. One member was a guy he went to high school with. They never really knew each other in school, but they became friends in the support group. The group meets just once a month, so he cherishes the opportunity to get together. “Everything just worked out perfectly,” he says. “I feel like now, these people, even though we don’t speak every day, I feel like I know that I can call them and they’ll have my back. And I can speak to them about anything and not feel judged or anything. 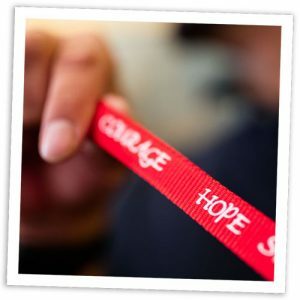 Henry’s lanyard is a constant reminder of how he should approach each day — with courage, hope and strength. 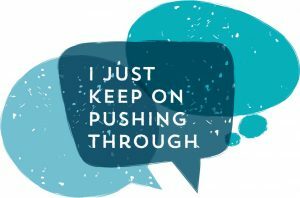 Having people to talk out his problems with, and knowing there were others facing the same challenges, helped give him strength when he needed it most. Now he wants to help other people who are in the same situation. Like a lot of people who’ve been diagnosed with HIV, Henry had problems at first with his longtime partner. But the bonds that kept them together all these years were strong enough to help them overcome. 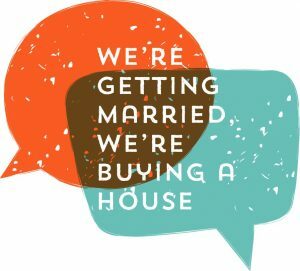 Yes, it was bad, he admits, “but, now, we’re getting married, we’re buying a house, we bought our first brand new cars together. That’s the power of pushing through till your life improves.